Optimally, to best modify your dog’s inappropriate chewing behavior, we need to consider the preceding causal factors as the primary behavioral problem while concurrently addressing the inappropriate chewing behavior as a secondary symptom. In addition, until the behavior is modified, we need to prevent the continuation of the behavior by establishing management procedures that may include supervision and/or confinement, we need to consistently divert or punish inappropriate behavior immediately when it occurs, and we need to positively reinforce acceptable chewing behavior as a replacement for the existing destructive behavior. By taking a properly designed four-pronged approach (origins, prevention, punishment, and encouraging replacement chewing activity), we should effectively modify the behavior. Dogs are not born knowing which potential chew items are encouraged for use by humans and which items are verboten. Therefore, you need to actively teach your dog which items you wish him/her to chew and which items are prohibited. Moreover, when you are not able to closely supervise your dog, you need to crate him or confine him via closed doors or baby gates to an area where he will act responsibly. Premature freedom allows an untrained dog to passively teach himself which items are most orally satisfying. While supervising, encourage your dog to chew appropriate items by handing him the items, interactively using the items during play sessions, placing the items in a designated toy box, and selecting items that your dog finds innately intriguing and satisfying. Praise him lavishly whenever he selects a desired item. Excellent chew items include knuckle bones, sterilized bones, antlers, compressed rawhide, nylabones, gumabones, stuffed animals for dogs, squeaky toys, kong toys, dental kongs, rope toys, soccer balls, and hard plastic balls for dogs. Please be aware that hard chew items can cause fractured teeth, especially if your dog is a hard biter and chews the items principally with his molars or pre-molars. In addition, certain consumable chew items may prompt diarrhea, rawhides can cause intestinal blockages if they are not well chewed before they are swallowed, squeakies can cause blockages if your dog removes the squeaker from the inside of the toy, rope toys can cause intestinal blockages if large portions are ingested, and small toys can cause esophageal or intestinal blockages if they are swallowed whole. Consequently, you should initially monitor your dog’s chewing habits if you are uncertain whether he will safely manage a specific chew item or play toy. Select about 10 appropriate items. Then, leave only 4 out at a time. Preferably, place the 4 play/chew items in a designated toy box. Rotate the items as your dog becomes bored with a particular item from the available four. 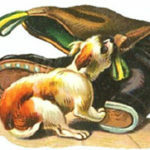 An excess amount of items available at any one time can create confusion in some dogs, whereby they have difficulty discerning appropriate from inappropriate items, especially if the chew items consist of a similar material, texture, or dimension to items in the house that they are not supposed to chew. Curiosity and exploration are traits common to many adventurous, confident dogs, especially young puppies. Moreover, just like young children, dogs tend to often explore with their mouths. Consequently, if your dog is young, curious, and/or exploratory, you need to closely supervise him whenever he is unconfined, so that you can consistently teach him which items are acceptable for chewing and which items are inappropriate. Chewing is a normal behavior. Oral stimulation provides comfort and activity to both young and adult dogs. Resultantly, most dogs enjoy chewing activity. In particular, young dogs, teething dogs, bored dogs, under-stimulated dogs, possessive dogs, and anxious dogs tend to enjoy finding items to chew. Since chewing is a normal behavior and we wish your dog to receive the pleasant stimulation provided by chewing, the major solution when addressing the causation of satisfying the quest for oral stimulation is by setting your dog up for success. By interacting and praising, teach him which items are appropriate. Moreover, purchase desirable chew items that your dog will prefer to the trim, the sofa, the remote control, and other inappropriate objects. In addition, confine him to a responsible area when you are unable to supervise, at least until he is mature enough and stable enough to act responsibly without supervision. Puppies are born without teeth. Between the ages of 4 to 8 weeks puppies will develop a full set of 28 deciduous teeth. At approximately 4 months of age, but possibly one month earlier or later, puppies will begin shedding their deciduous dentition and a set of 42 permanent adult teeth will erupt in their place. The process will usually persist until about 7 months of age, but may take until the eighth month of life to complete. During this teething stage, your dog’s gums may be uncomfortable and inflamed. Chewing serves to psychologically divert and to physically alleviate the discomfort. To further minimize aches from sore gums, try wetting and freezing a rope toy or a long, thin vegetable, such as a carrot. The cold from the ice will further help to reduce pain and misery. In addition, during the teething stage, be careful not to play tug games with your dog, as they can cause him to dislodge a tooth and the associated pain may condition him to permanently dislike the toy involved in the tugging game. Many dogs learn that grabbing an inappropriate item is a reliable method of obtaining owner attention. Consequently, if your dog grabs or chews inappropriate items in your presence and you believe your dog’s objective is attention-seeking, then either ignore your dog or discipline your dog via a method other than a verbal reprimand and certainly do not chase your dog. If the object your dog seized is inexpensive and innocuous, then simply ignore your dog so that he does not receive attention. Then, provide him the attention he desires once he drops the object. In addition, in general, provide him attention proactively when he is calm and adheres to desired household protocols. Once he learns that he receives pleasant attention for acting calmly and that he does not receive owner attention when he grabs inappropriate objects, the undesirable attention seeking behavior should extinguish. If your dog orally grasps an expensive or potentially dangerous object, then you may wish to take a more active approach than simply ignoring him. You can calmly walk up to him with a delectable treat, show him the treat, say “Drop,” and then give him the treat once he drops the object. Alternatively, if the behavior is habitual and more positive methods have been unsuccessful, you may wish to incorporate aversive conditioning. Employ an aversive, such as a shake can, air horn or water pistol, as soon as he picks up the disallowed object. Then, provide him praise, attention, and/or play a few seconds after he has dropped the object. If your dog strongly dislikes the aversive and you are consistent in applying the method, your dog will quickly become conditioned to associate the onset of the aversive with the onset of his inappropriate chewing behavior. Thus, he will elect to curtail his inappropriate attention seeking activity. Nevertheless, despite the above methods that address your dog’s behavior after he grabs an inappropriate object, the best way to extinguish attention seeking behavior is by preempting his attention and energy needs. Increase the frequency, duration, and/or difficulty of his daily walks, exercise, obedience training sessions, and play periods. A tired dog is a happy dog and belongs to a happy owner. Lastly, proactively reward him with play and affection when he is calm and acting appropriately. Teach him that calm behavior is effective in attracting your attention, whereas grabbing inappropriate items is ineffective. Bored dogs tend to chew inappropriately either in an exploratory effort to find something fun to do or to obtain physiological relaxation via a dopamine and endorphin release that counters the stressful effects of a mundane environment. If boredom is the reason your dog chews, proactively stimulate your dog with regularly scheduled walks, exercise, play, and obedience sessions. In addition, construct his indoor and/or outdoor environments so that they are more stimulating. Provide intriguing chew items and play toys indoors. In addition to chew items and play toys, provide a shaded area, a sandbox for digging, some jumps, and an agility tunnel in his outdoor environment. General under-stimulation is similar to boredom, but is a more prevailing and omnipresent problem than momentary or sporadic boredom. Lack of adequate visual, auditory, olfactory, tactile, physical, and cerebral stimulation can prompt undesirable exploratory, attention-seeking, and anxious chewing behaviors. To combat general under-stimulation provide regular walks, exercise, obedience training, and play sessions. In addition, provide a view to the outdoors, where your dog can view and hear wildlife, relax your dog with lavender aromatherapy, stimulate him with an open screened window where he can smell what is happening outdoors, and provide him intriguing chew items and play toys. Barrier frustration occurs when a dog becomes frustrated at confinement or restraint, especially when a target of his desire, such as another dog, a person, or wildlife, has unrestricted freedom. Dogs that chew from barrier frustration often chew shutters, curtains, or windowsills adjoining a window that provides exposure to an attractive visual target. Solutions include proactive stimulation along with mechanisms that keep the dog away from the window when he is unsupervised. Separation anxiety/distress is a probable cause when inappropriate chewing occurs exclusively when you are not home or are inaccessible or when the behavior becomes more pronounced when you are not home. Separation anxiety is a complex problem that has its own article within the CPT website. To properly treat the chewing problem for the long-term, you need to first successfully treat your dog’s separation distress. Nevertheless, if your dog manifests his separation distress by destructively chewing parts of the house or loose personal items, then in the interim, until his separation distress is resolved, confine him to a crate or a room where he will be responsible, so that you prevent continuation of the chewing habit as a coping mechanism for his anxiety and minimize the risk of further damage to property. Dogs that are generally anxious or stressed will often seek physiological relaxation via the dopamine and endorphin release provided by chewing. To resolve the problem, your dog’s general anxiety needs to be treated separately. Primary sources of stress need to be identified and their exposure limited or prevented, and a proactive stimulation, impulse control training, and leadership training program needs to be commenced. A counterconditioning/desensitization program geared toward relaxing your dog amidst primary sources of stress is also advised. 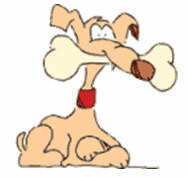 In addition, severely anxious dogs may benefit from homeopathic remedies or pharmaceutical anti-anxiety medication. Some dogs will exhibit obsessive-compulsive behavior by incessantly chewing a particular object. A chewing behavior can be classified as obsessive-compulsive when it is extreme in frequency or duration, occurs out of context, interferes with normal activities or functions, and/or its prevention or absence causes an increase in anxious arousal. For instance, a dog that becomes inordinately restless or distraught when a certain toy or item is removed or that regularly chews or carries an item without interruption to the point of foregoing bathroom activities, meals, or social contact may be classified as obsessive-compulsive. To eliminate obsessive-compulsive behavior, remove access to the item, divert behavior to a more productive in-context activity, increase walking, exercise, training, and play time, and consider homeopathic or pharmaceutical anti-anxiety remedies. Until you have had ample time to effectively address the cause of your dog’s inappropriate chewing behavior, regardless of what the cause may be, you must prevent the continuation of his bad habits by consistently supervising when you are home and crating or confining when you are not home or are home and unable to closely monitor his activities. Dogs typically perform behaviors because the behaviors are self-rewarding, they satisfy a need, and/or they resolve a problem. For your dog to develop a new method of providing intrinsic rewards, satisfying needs, or coping with or resolving problems, we need to first prevent the continuation of the present habitual activity. By making the current activity unavailable, we can better present the dog with a favorable dilemma, whereby we can productively prompt adoption of a mutually acceptable replacement behavior. To affect permanent behavior modification, in addition to addressing the cause(s) and preventing continued unsupervised access to inappropriate items, we may need to implement a system of punishment or aversive conditioning. An effective punishment or aversive conditioning strategy alters your dog’s perception of inappropriate chewing activity from something that is favorable and pleasant to something that brings forth unpleasant outcomes. Consequently, your dog will reduce the frequency of his inappropriate chewing behavior and we can more successfully incorporate positive reinforcement to encourage the adoption of a mutually desirable replacement chewing activity. For a punishment or aversive conditioning strategy to work effectively, you must employ the system with consistency, the punishment or aversive must be something that the dog will wish to escape immediately and avoid entirely in the future, and the timing must be correct, where the punishment or aversive commences promptly upon the commencement of the chewing behavior and ceases immediately upon the cessation of the chewing behavior. If inappropriate chewing behavior is infrequent or not very strong, then punishment will likely not be required and you can focus on quality of life solutions that address the origin of the behavior, along with prevention strategies and encouraging a replacement behavior. If inappropriate chewing behavior occurs due to separation anxiety or general anxiety, then there is a risk that punishment could escalate your dog’s anxious emotional state and exacerbate the chewing behavior or spawn another undesirable behavior. On the other hand, if your dog’s chewing behavior is frequent and strong and not due to anxiety, then punishment may be required to compel your dog to seek a mutually acceptable replacement behavior. There are several types of punishment, including active, semi-active, and passive. An active punishment requires your presence and is clearly derived from your actions. A semi-active punishment requires your presence, but does not conspicuously occur from your actions. A passive punisher works regardless of whether you are present and does not occur from your direct action. The simplest type of active punishment is a verbal reprimand. When you are supervising your dog and you observe him chewing an inappropriate object, communicate a verbal “No” in a deep growling voice, followed by praise when he ceases the chewing activity. At that time you may also wish to offer him an acceptable chew item, such as a sterilized bone, antler, or compressed rawhide. To avoid inadvertent complications, when you verbally reprimand him, do not use his name and do not call him to you. Alternatively to growling a verbal reprimand, you may use a semi-active aversive punisher, such as a shake can, air horn, clanging pots, or a squirt gun that creates a fear-startle response that effectively interrupts the behavior. We prefer semi-active punishment if your dog ignores verbal reprimands, you have relationship issues with your dog, your dog is overly frightened by verbal admonishment, or your dog only chews inappropriately when you are not proximal. Do not reprimand him or semi-actively punish him if you do not catch him in the act. Punishment must occur while the infraction occurs and cease immediately upon the cessation of the infraction. When the infraction ceases, offer him an appropriate chew or play item from his toy box, then praise him for converting to the appropriate object. In addition, since there may be occasions when you cannot adequately supervise and you miss catching your dog in the act, even if your dog is tethered or otherwise closely supervised, we also recommend establishing a system of passive punishment. Passive punishment is especially effective when a dog repeatedly returns to chew the same inappropriate object. Passive punishment also has the advantage of immediate timing. Passive punishers include bitter lime gel, bitter apple spray, hot paste, and electronic mats. Passive punishers consistently prevent and/or discipline the continuation of infractions on occasions when you are unable to effectively supervise. Simply apply the passive punisher on or about the area or object where the dog commits the infraction. When your dog returns to the site, instead of achieving a pleasant outcome, your dog will immediately achieve an unpleasant outcome, which should deter your dog from repeating the behavior and instead prompt him to seek an alternative chewing behavior. Therefore, afterward we can more productively switch to a strategy of positive reinforcement that encourages the adoption of a mutually desirable replacement behavior. Punishment works better at indelibly modifying chewing behavior when combined with a system that effectively teaches your dog how to immediately escape the punishment and eventually how to permanently avoid the punishment entirely. The best way to instruct your dog how to escape and avoid punishment is by immediately following the punishment with a physical and/or verbal prompt that encourages your dog to begin chewing an appropriate item. You can say the item’s name, move the object with your hand, place the object in or toward your dog’s mouth, begin playing with the object alone, or solicit your dog to play along with you to better attract your dog’s attention and obtain his interest in the item. Once he begins chewing the item, praise him so that he understands you are pleased with his behavior, while being careful not to praise so effusively to the point where he becomes distracted from the object. If all goes according to plan, by addressing the cause of your dog’s chewing behavior, preventing the continuation of undesirable behavior via active supervision and passive confinement, punishing or diverting inappropriate behavior actively, semi-actively, and/or passively, and prompting him to chew appropriate items, he should permanently replace undesirable chewing behavior with desirable chewing activities that satisfy your objectives while concurrently satisfying his needs for oral stimulation. Nevertheless, destructive chewing is often a complex behavior that is difficult to resolve without the services of a professional trainer or behaviorist. Therefore, we recommend the inclusion of a CPT in-home private lesson to raise the probability of a proper diagnosis of the origin of your dog’s behavior and to more effectively instruct solution techniques. To schedule a CPT in-home private lesson, please contact the CPT office by phone at 404-236-2150 or contact us by e-mail via the Contact link at the top right of this web page.